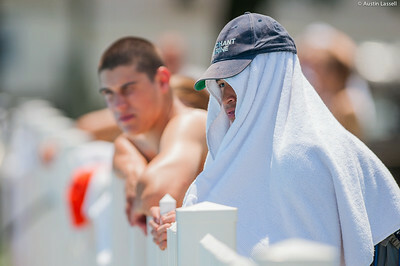 A candidate wears a towel in order to keep cool while awaiting the start of the Waterfront Games on July 20th, 2014. 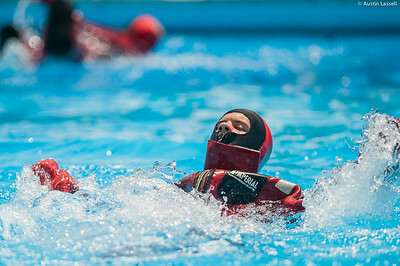 At the conclusion of indoctrination candidates are given the chance to relax and let loose through a series of carefree games held at the Waterfront. Candidate awaiting the start of the Waterfront Games on July 20th, 2014. 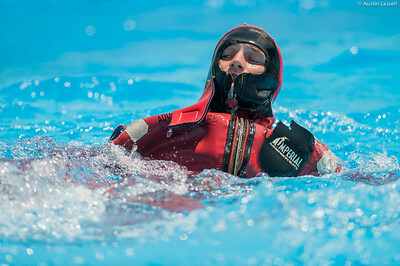 At the conclusion of indoctrination candidates are given the chance to relax and let loose through a series of carefree games held at the Waterfront. Regimental Waterfront Officer, RWO, Alysia Johnson poses for a photo leading up to the end of indoctrination Waterfront Games on July 20th, 2014. 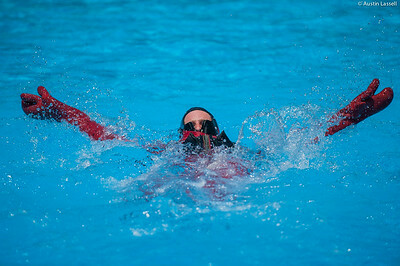 A USMMA candidate swims as fast as possible in a cumbersome survival "gumby" suit as part of a gumby suit relay race during the end of Indoctrination Waterfront Games on July 20th, 2014. 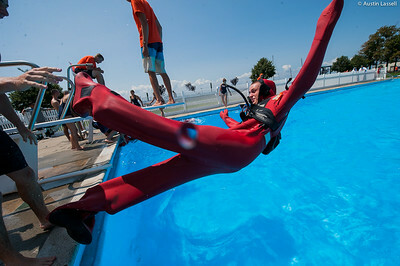 A USMMA candidate jumps into the pool to begin a lap in a cumbersome survival "gumby" suit as part of a gumby suit relay race during the end of Indoctrination Waterfront Games on July 20th, 2014. 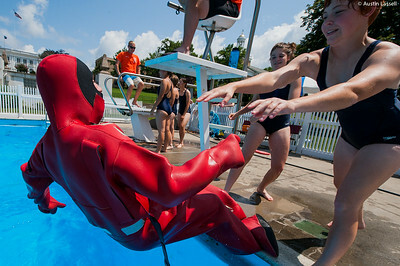 USMMA candidates help a fellow candidate exit the pool after finishing a lap in a cumbersome survival "gumby" suit as part of a gumby suit relay race during the end of Indoctrination Waterfront Games on July 20th, 2014. 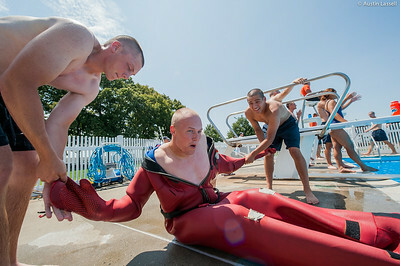 USMMA candidates help a fellow candidate remove the cumbersome survival "gumby" suit after swimming a lap of a gumby suit relay race during the end of Indoctrination Waterfront Games on July 20th, 2014. 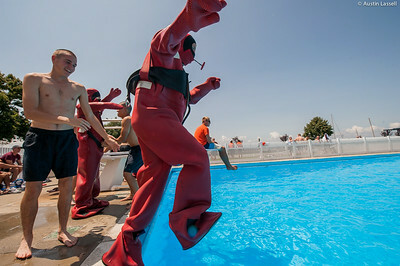 USMMA candidates look on as a fellow candidate swims as fast as possible in a cumbersome survival "gumby" suit as part of a gumby suit relay race during the end of Indoctrination Waterfront Games on July 20th, 2014. Candidates competing in a form of tug-o-war during the end of Indoctrination Waterfront Games on July 20th, 2014. In this game the goal is to use the water from the fire hoses to move the bucket suspended on the wire high above the ground to the side of the opposing team. This proves to be difficult as teams must react quickly while controlling the force of the fire hose pushing back. 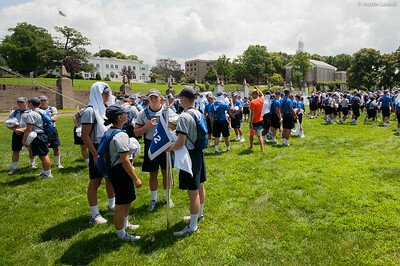 Candidates competing in a form of tug-o-war during the end of Indoctrination Waterfront Games on July 20th, 2014. In this game the goal is to use the water from the fire hoses to move the bucket suspended on the wire high above the ground to the side of the opposing team. This proves to be difficult as teams must react quickly while controlling the force of the fire hose pushing back. The candidates on the right smile as they are about to win, having pushed the bucket too far to one end for the other team to catch up. 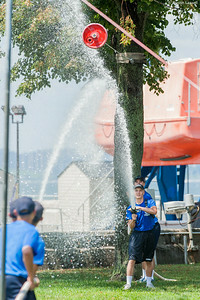 A Waterfront Midshipman preps a giant slip and slide that is part of the end of Indoctrination Waterfront Games on July 20th, 2014. A candidate excitedly goes down the giant slip and slide that is part of the end of Indoctrination Waterfront Games on July 20th, 2014. Candidates pose for a photo in between events during the end of Indoctrination Waterfront Games on July 20th, 2014. 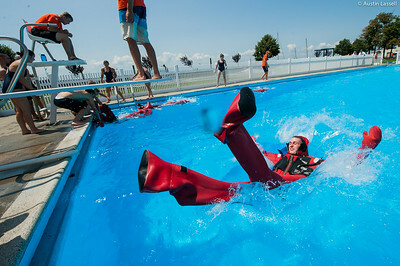 A candidate excitedly leaps horizontally onto the giant slip and slide that is part of the end of Indoctrination Waterfront Games on July 20th, 2014. Candidates cringe at cold water as they get soap washed off after going down the giant slip and slide, seen at right, that is part of the end of Indoctrination Waterfront Games on July 20th, 2014. 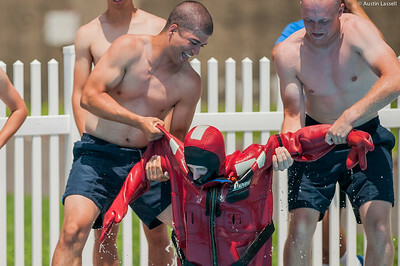 USMMA candidates attempt to put on the cumbersome survival "gumby" suit before starting a lap of a gumby suit relay race during the end of Indoctrination Waterfront Games on July 20th, 2014. 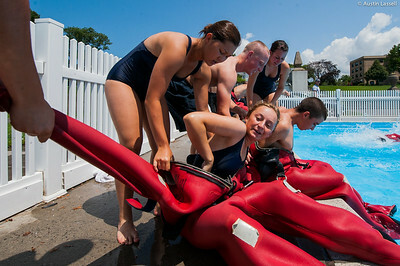 USMMA candidates help a fellow candidate put on the cumbersome survival "gumby" suit before starting a lap of a gumby suit relay race during the end of Indoctrination Waterfront Games on July 20th, 2014. 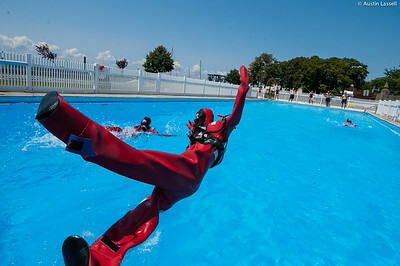 A USMMA candidate leaps backwards into the pool to begin a lap in a cumbersome survival "gumby" suit as part of a gumby suit relay race during the end of Indoctrination Waterfront Games on July 20th, 2014. 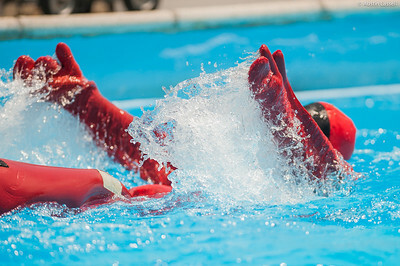 A USMMA candidate gets pushed backwards into the pool to begin a lap in a cumbersome survival "gumby" suit as part of a gumby suit relay race during the end of Indoctrination Waterfront Games on July 20th, 2014.